Boeing have rolled out the 787th example of the Boeing 787 Dreamliner. The aircraft is destined for China Southern and has a few special decals to mark the occasion. With over 1,400 orders on the books, there are many more deliveries to come. The programme is very successful and airlines are reported to be very pleased with their purchase. China Southern’s aircraft features a very large decal proclaiming this milestone. Positioned on the forward fuselage, it is definitely eye catching. Whether it will remain on the aircraft when it goes into service remains to be seen. Either way, it’s a nice way to celebrate something a little different. Boeing has form in adding special decals to milestone deliveries. While the 787th Boeing 787 has one, other aircraft also received attention. For example, the 500th Boeing 747 for SAS received one, the 1,000th for Singapore Airlines did too, and so did the 1,500th for Lufthansa. It’s a nice little bit of marketing to make the customer feel special and to mark the occasion. That’s certainly why it is has been shared on social media – good for Boeing and good for the airline, China Southern in this case. The 787th Dreamliner looks great in the China Southern livery. The Guangzhou based airline has a number of Boeing 787-10 aircraft on order, so there will be more deliveries to come. What do you think of this kind of celebration of a delivery milestone? Should they have done it now, or waited until aircraft number 1,000 was ready to go? All images via Boeing on Twitter. NextALL BLACK FRIDAY TRAVEL DEALS: A Comprehensive, Updated Master List! 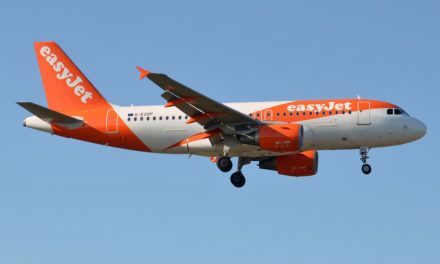 Did you know easyJet let you go Hands Free?